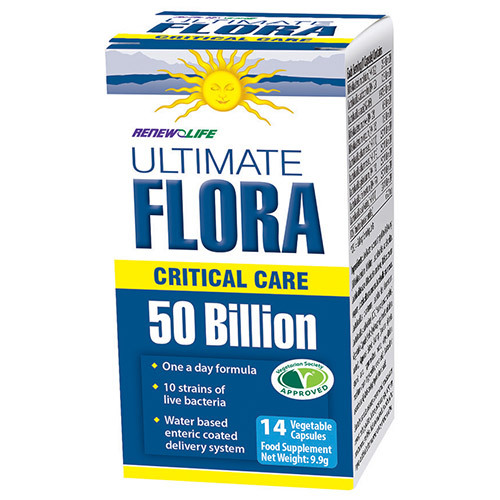 Ultimate Flora Critical Care contains therapeutic levels of both Lactobacilli and Bifidobacterium, making it the most complete and effective probiotic supplement on the market. Each capsule provides 50 Billion active cultures from 10 different strains in a ‘once a day’ serving (30 billion active cultures of Bifidobacterium and 20 billion active cultures of Lactobacilli and Lactococcus). Live bacteria consisting of the following: (Bifidobacterium bifidum, Lactobacillus acidophilus, Lactobacillus casei, Bifidobacterium breve, Bifidobacterium longum, Lactobacillus rhamnosus, Lactobacillus plantarum, Lactobacillus fermentum, Lactobacillus salivarius), FOS (fructooligosaccharides), Vegetable Capsule Shell: (hydroxypropyl methylcellulose, water), Aqueous Enteric Coating: (sodium alginate, stearic acid, hypromellose, water, ethylcellulose, medium chain triglycerides, oleic acid), Antioxidant: ascorbic acid, Anti-caking Agent: stearic acid, Cryoprotective Agent (contains milk and soy). Take 1 capsule per day, away from food. If you are on antibiotics, take at least 2-3 hours before or after. Store in a dry place at 25°C or below. Best if refrigerated. Do not expose to heat or moisture. 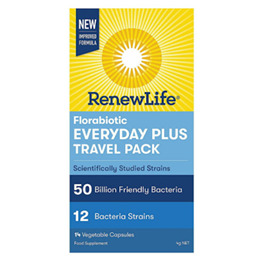 Below are reviews of Renew Life Ultimate Flora - Critical Care - 14 Capsules - Best before date is 30th April 2019 by bodykind customers. If you have tried this product we'd love to hear what you think so please leave a review.